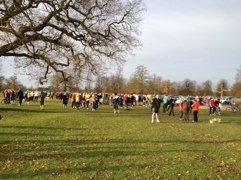 Parkrun in Bushy took place in great weather as usual and a surprisingly large number of runners for Christmas Eve, 821 to be precise. I just went for a run rather than a race so managed 23:37, my mind is already on a 20 mile run on the South Downs I’m planning for next week when we are staying with my parents in law. I’ll miss the Christmas Day run as I’ll be swimming at Hampton outdoor pool but I’ll be back in Bushy on New Years Eve and Day. Well here it is, my first ever blog on my weekly efforts to get out running, despite the challenges of the British weather. Quite how often I manage to update this will remain to be seen, but hopefully it will get done when my technology is transferring my dismally slow time details to Garmin’s website for the entertainment of all.